Rainford Tennis Club have received a grant from St Helens District Sports Council to support our weekly Family Fitness Session and to help grow the number of disabled people playing tennis. The grant will provide equipment for the popular Family Fitness session, which takes place every Sunday morning at 9.00am at the Jubilee Recreation Ground. In addition, the Club plans to increase the number of disabled people playing at the venue once the new courts have been built. The funding will allow our Director of Tennis, Steve Vincent to attend the appropriate Tennis Foundation courses to allow this to happen. 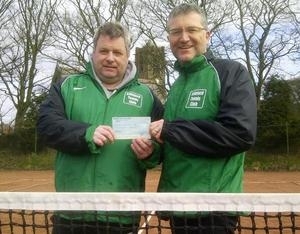 John Case (Secretary) and Ian Spencer (Vice-Chairperson) from Rainford Tennis Club are pictured receiving the cheque from St Helens District Sports Council. "We would like to thank St Helens District Sports Council for their continued support" said Ian. "This is going to be a very exciting year for sport in Rainford and we are very grateful that this grant will help us achieve our aims to get more people playing sport at our Club."